expertise crucial to IoT success. A successful project requires extensive, broad sets of expertise to come together seamlessly. The puzzle starts with device hardware and firmware, and continues with network connectivity, custom applications, and platform integration. It gets further complicated with data and business insights. Our clients come to us for our expertise across these broad skill sets. They partner with us because we can bridge the gaps, architecting the right solutions end-to-end. We have the experience to bring your project to life smoothly and quickly, and to guide you safely around the pitfalls that plague so many IoT deployments. We know IoT technology inside and out. We’ll guide you through the sea of IoT hardware, platforms, and applications as a trusted, unbiased partner. A crucial, yet one complicated and burdensome piece of a successful IoT deployment, this is where our experience will become your greatest asset. Our team will help you quickly design, build, and launch custom hardware and device solutions, applications, or an entire end-to-end technology stack. Headache-free device management: we’ll monitor, troubleshoot and provide continuous updates for all of your devices. Conquer the world of real-time analytics, optimizing operations on a new level. The right data analysis can identify bottlenecks, uncover trends, and predict failure before it’s too late. Get powerful insights and metrics that are meaningful to your business. Make your data work for you. Algorithms designed for your business needs for meaningful, actionable results. Combine device and sensor data with metadata, geo-location, environmental information, and more. Real-time calculations that can be automated into your workflow. Put an end to data silos. We’ll combine all of your data from separate sources in one place. Let’s talk about security. Is your IoT ecosystem secure at every link? Everything we deploy lives up to the highest industry security standards, so you can free yourself from worry of a hack or an attack. And, we can find - and fix - the vulnerabilities in your legacy systems before someone else does. Performance and penetration testing are just the beginning. 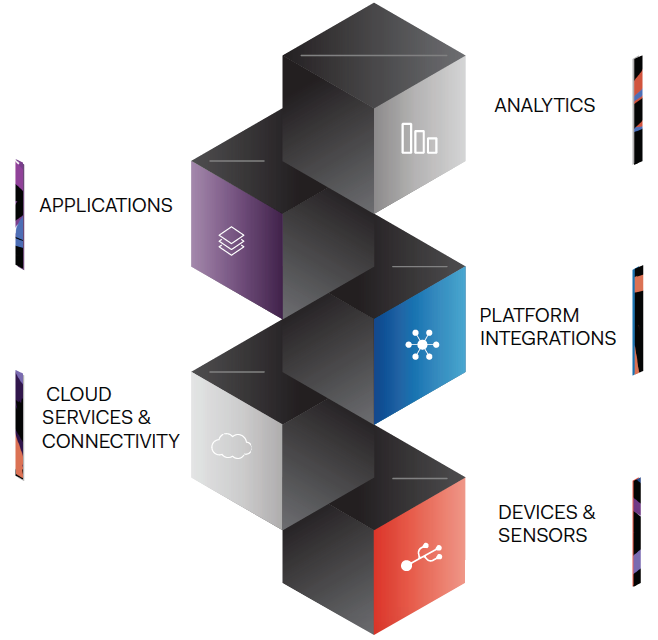 We’re leading the IoT industry in strategic, multi-layered protection for devices, data, connectivity, applications, access and authentication. Don’t be the next breach. Work with a partner you can trust to ensure your IoT network is rock solid. Contact us. Or read more about our success stories with other clients.